We live in suburban Perth. 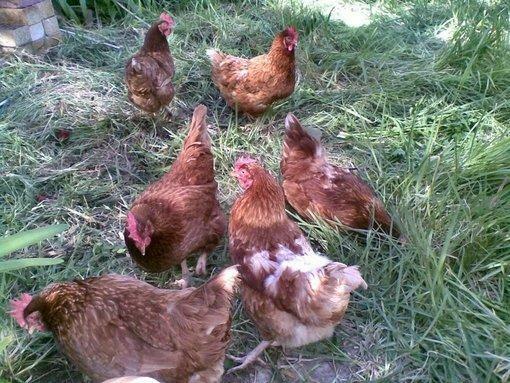 Our 6 hens provide us with a lot of pleasure, they keep me company when I am gardening, they eat weeds and help dig over the garden beds. One we call Boss Chook is the oldest and tamest my daughter loves to cuddle her and she is very calm and even seems to enjoy the attention. They all have their own personalities and our favourite is a very cheeky one named Raggedy Ann who may turn out to be Raggedy Andy. Here they all are working on some overgrown grass. Well we are still not sure about Raggedy Ann but she probably isn't laying due to an unseasonal moult. However, since she did have quite bad saddle damage due to a rooster, I figure she probably is a hen not a roo. Here is a close up of the saddle and wing which was bare and sore looking when we got her. She was dropping feathers at an alarming rate! Then at last, new feathers appearing on the saddle and neck. One week after the above picture was taken she started to lay. I think she is attempting a coup in the coop as well!